NANOSENSORS™ AR5-NCHR AFM tips are designed for non-contact mode or tapping mode AFM. This probe type combines high operation stability with outstanding sensitivity and fast scanning ability. For measurements on samples with sidewall angles approaching 90° NANOSENSORS™ produces specially tailored tips. 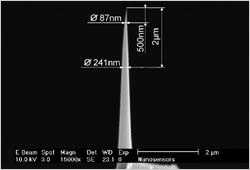 These tips ar FIB (Focused Ion Beam) milled to achieve a high aspect ratio portion better than 5:1 at the end of the common silicon tip. This subtractive method of producing the high aspect ratio needle offers the advantage of high lateral stiffness and rigidity of the tip. The reflex coating is 30 nm thick aluminum coating on the detector side of the cantilever which enhances the reflectivity of the laser beam by a factor of about 2.5. Furthermore it prevents light from interfering within the cantilever. The virtually stress-free coating is bending the cantilever less than 2% of the cantilever length.